Rates of melanoma, the deadliest form of skin cancer, are rising faster than any other cancer. This summer, we have launched a new #Skintervention TV ad featuring people who have been directly affected by melanoma. Watch the short 30 second video to hear from the people who have experienced it first-hand. And remember to share this video with everyone you know, because this #Skintervention could save their life. Melanoma is a type of skin cancer that forms in the cells that make melanin. It starts on the normal skin surface and looks like a mole. If melanoma is diagnosed early there is a better chance of cure. Early detection saves lives. Melanoma is the most serious type of skin cancer. It affects both men and women and can affect people of all ages. Over 1,000 cases of melanoma are diagnosed in Ireland each year. If any of your family or friends are soaking up the sun without protecting their skin, share this #skintervention video with them. The skin is an organ, like your heart and kidneys. The skin is the biggest organ in the body. Your skin does several important jobs such as acting as a barrier and protecting everything inside your body. The skin is made up of two main layers: the epidermis on the outside and the dermis underneath. New cells are made in the deep layers of the epidermis and are pushed towards the surface. The epidermis is mainly made up of flat, scale-like cells called squamous cells. These cells make a substance called keratin, a tough, waxy substance that helps to make the skin strong enough to protect the body. At the base of the epidermis are cells called melanocytes which make a pigment called melanin. This pigment gives your skin its colour and protects it from ultraviolet (UV) rays in sunlight. Under the squamous cells are round cells called basal cells. These cells constantly divide to form new keratin-producing cells to replace the ones that wear off the skin’s surface. 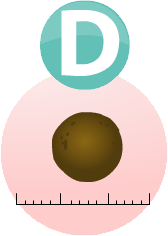 The border of an early melanoma tends to be uneven. The edges may be scalloped or notched. Dr Ormond on the ABCDEF method examining moles. Below are some images of moles that are melanomas. These images are just here as a guide. If you are worried about any moles or skin changes, it is important that you go to your GP immediately to get it checked out. The photo shows a very dark mole. Darkening is one possible sign that a mole is becoming cancerous and could be a melanoma. This mole is about a centimetre across. The photo shows the irregular outline of a melanoma. 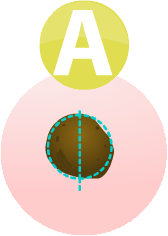 Normal moles are usually much rounder, with smooth borders. 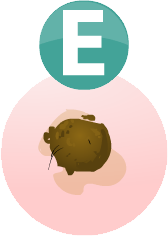 The photo shows a mole that has an area of inflammation around it. The inflamed area is about 7 millimetres at its widest but you can see that the original mole is much smaller than that. Inflammation is another sign that a mole may be developing into a melanoma and needs to be checked out by a doctor. This is an image of a very small melanoma. It is only about 4 or 5 millimetres across. But you can see clearly that it is not the same colour throughout. It also has an irregular shape. Irregular colour and shape are signs that should be checked by a doctor. The picture shows clearly a melanoma that is spreading out from a normal mole. If you have a mole that has changed in this way, you should see your doctor as soon as possible. The exact cause of melanoma is not known but there are certain things that increase your chances of getting the disease. These are called risk factors. 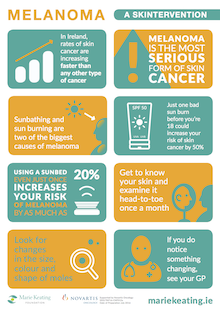 If you have one or more risk factors for melanoma, it does not mean that you will definitely get the disease, but it does mean that you should be especially careful about monitoring your skin for any changes, you should be SunSmart, and you should go to your GP straight away if you notice any changes. The more moles you have on your body, the higher your risk of melanoma. You should be very careful about exposing yourself to the sun and should keep an eye on all your moles. People who have had sunburn are twice as likely to get melanoma as those who have not. The risk is higher if you have had sunburn several times in your life. UV light comes from the sun. Over exposure to sunlight can cause patches of rough, dry skin called solar keratoses, which increases your risk of melanoma by up to 4 times. If you have a family history of any type of skin cancer then your risk increases. Using a sunbed, even just once, increases your risk of melanoma by 20%. Using a sunbed before the age of 35 increases your risk by almost 60%. Never, ever use sunbeds. People who are exposed to strong sunlight now and then, for example if you live in Ireland and holiday in a hot country, are more at risk of melanoma than people who are continuously exposed to sunlight. A very rare type, called a congenital giant melanocytic naevus, can develop into a melanoma. They are very common on the buttock. Fair skinned people born in a hot country, for example Australia, have a higher risk than people who went to live in a hot country as a teenager or people with similar skin colouring who live in cooler climates. 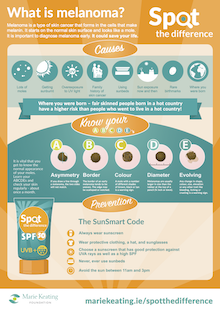 You can reduce your risk of melanoma as well as most other forms of skin cancer by following the SumSmart code. Remember, it is also vital that you pay attention to any changes in your skin. Examine your skin regularly and visit your GP without delay if you notice anything irregular. Apply the cream 20-30 minutes before going out into the sun. Apply thickly and evenly every 2 hours no matter how high its protection. Apply the equivalent of a shot glass full of sunscreen to each limb and to your body and about half this much to your face. Always reapply after swimming or perspiring. Remember no sunscreen gives 0% protection from the sun. ...as this is when the sun's rays are strongest. This applies all year round, not just in summer. It is important to remember that the sun's rays are present even on a cloudy day. Sunbeds are not a safe alternative to tanning outdoors. The intensity of some of the UV rays they give off can be 10 to 15 times higher than that of the midday sun. Using a sunbed, even just once, increases your risk of melanoma by 20%. Using a sunbed before the age of 35 increases your risk by almost 60%. The signs of melanoma are that a mole has changed in size, shape and colour or it looks red and inflamed, oozes, bleeds, is crusty or is itchy or painful. 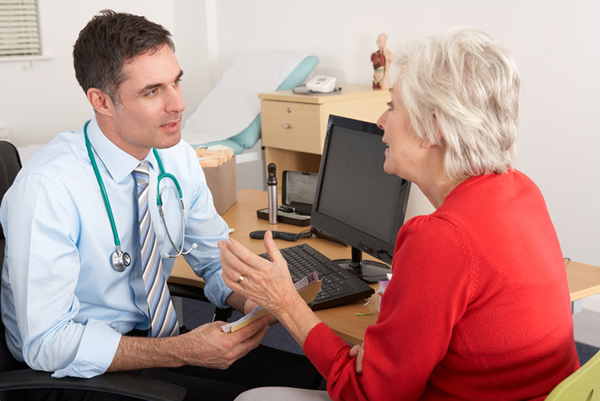 If you notice any of these changes, you should see your GP without delay. Your GP will look at the mole and ask you what you have noticed about it. He or she will examine your skin and if they think that your mole looks as if it might be melanoma, they will arrange for you to see a skin specialist, called a dermatologist. You should be seen within 2 weeks. A dermatoscopy may be used by the dermatologist to help make the initial diagnosis. The doctor uses an instrument called a dermatoscope to closely examine the suspicious area on your skin. The doctor puts some oil on to your skin and then holds the dermatoscope in their hand, a bit like a magnifying glass. This can magnify the area by up to 10 times so that the doctor can see it very clearly. It is completely painless. A biopsy means taking a sample of cells and looking at them under a microscope. However, in the case of a suspicious mole, instead of taking just a sample, the dermatologist or a plastic surgeon will take the entire mole. This is called an excision biopsy. When you go to have your mole removed, the nurse or doctor will ask you to lie down on a couch in the treatment room. First you have an injection of local anaesthetic into the area close to the mole to numb it. The doctor then cuts out the mole. He or she will also remove 2mm of tissue around the mole to help ensure that, if the mole is cancerous, that they have removed all of the cancerous cells. The mole is then sent to the laboratory for close examination under a microscope. You may need to have a few stitches in the place where the mole was removed. These will usually dissolve after a few days, or you may need to go back to the doctor's office to have them removed. You may get your biopsy results at the hospital or at your GP surgery. If the mole contained any cancerous cells you may need to have more tests. If not, you will not need any more treatment. Your doctor will discuss this with you. If your mole contained cancerous or precancerous cells, a tissue specialist (histopathologist) will look at the biopsy tissue very closely in the laboratory. Your doctor will ask you to go into hospital for an operation to take away more tissue. This aims to remove any abnormal cells that may have been left behind in the area close to the melanoma. It reduces the chance of the melanoma coming back in the future. The operation is called a wide local excision. You can read more about this in the Surgery section under the Treatment part of this website. If you are found to have melanoma, your doctor will check how deep the melanoma is. The depth of the melanoma in the skin affects how likely it is to come back and whether it may spread. If you have early stage melanoma that is only in the surface layers of the skin, the melanoma is very unlikely to have spread anywhere else. You will not need to have further tests. If you do need further tests, your medical team will discuss these with you. These tests may include a sentinel lymph node biopsy, CT scan, ultrasound scan, MRI scan, PET scan with CT, and/or a bone scan. The treatment for melanoma depends on what state the cancer is diagnosed at. The stage of a melanoma describes how deeply it has grown into the skin, and whether it has spread. The tests you have to diagnose your melanoma will give some information about the stage. In Ireland, most melanomas are found at an early stage when the chance of cure is very high. If you notice any of these changes, contact your specialist or nurse to arrange an appointment to go back to the clinic. If you had Stage 1A or Stage 1B melanoma, you will also be shown these signs, and you will also be given some follow-up appointment dates for the outpatient clinic. If you have already had melanoma, it is important to note that you are more at risk of developing a second melanoma either in the same place or elsewhere on your body. You must remain vigilant, follow the SunSmart code, check your body regularly following the ABCDEs and visit your doctor regularly so that they can examine your skin. Different cancers may respond to different types of treatment and your treatment plan will be designed specifically for you. Your case will be discussed at a multidisciplinary team (MDT) meeting where all specialists in melanoma come together. Advanced melanoma may be treated through biological therapy or chemotherapy. Because your cancer is advanced, it usually means that surgery is no longer a treatment option, though you may have had surgery to help reduce the cancer in size or in the initial stages of diagnosis and testing. In some cases, if your melanoma has spread to only a limited degree, the MDT may decide that a type of surgery called limited surgical resection may help to reduce your difficult symptoms and improve your quality of life. When surgery is considered, careful patient selection is important and treatment must be individualized. Factors to be considered include the severity of symptoms, pace of disease progression, previous treatment and treatment response, patient age and medical condition, and the desires of the patient. Quality of life should be the principal goal of treatment for many patients. The two main types of biological therapy for melanoma are: • targeted treatments, which target gene changes • immunotherapy drugs, which help the body’s natural defence system (immune system) to find and destroy melanoma cells If you have Stage 4 melanoma, the doctor usually does genetic testing on your melanoma cells. This helps them decide which type of biological treatment might help you. The doctor looks to see if the melanoma cells have changes (mutations) in certain genes, such as the BRAF V600 gene. About 40 to 50 out of every 100 people with skin melanoma (40 to 50%) have this gene change. The change to the gene causes it to make an overactive BRAF protein. This makes cells grow and divide too fast. Targeted treatments that stop cells producing the BRAF protein and can slow or stop the growth of the cancer include vemurafenib (Zelboraf) and dabrafenib (Tafinlar). These drugs are not likely to work in people who don’t have the BRAF gene change. Your doctor will talk to you about which treatment is best for you. Immunotherapy is a type of biological therapy that helps the body’s natural defence system (immune system) to find and destroy melanoma cells. The immunotherapy drugs for melanoma are: • ipilimumab • pembrolizumab • nivolumab Doctors used to use two immunotherapy drugs called interferon and interleukin 2 to treat melanoma. They don’t use these drugs very often any more. You may have chemotherapy to try to control the melanoma by slowing the growth of the cancer cells and so improving your quality of life for a time, but it can’t cure the disease. Doctors usually try using chemotherapy after they have tried other treatments for melanoma as it is not as effective against this type of cancer as it is with others. Today, oncologists have newer forms of biological therapies that are more effective at fighting melanoma than chemotherapy is so they will usually try these first. You may receive chemotherapy as a tablet that you swallow, or by injection. 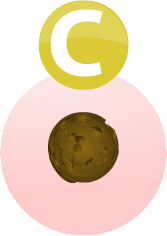 The most common chemotherapy drug for melanoma is dacarbazine (DTIC). You get this through a drip into your arm in the oncology day ward. A nurse puts a small tube into one of your veins and connects the drip to it. You usually have this type of chemo every few weeks. The time between one round of treatment and the start of the next is called a cycle. You usually have chemotherapy as a course of several cycles of treatment. Your doctor can tell you about your treatment plan. Chemotherapy to shrink a cancer and control symptoms is called ‘palliative chemotherapy’. To be told that treatment will be palliative can be very distressing and sometimes patients can fear that this means that they are at the very final stages of life. However, ideally palliative care is in place early in a patient’s treatment plan as it has been shown to help patients live comfortably for longer and with greater dignity. If you have any concerns or fears, talk to your nursing and medical team. If the first type of chemotherapy you have (called 1st-line treatment) does not control your cancer, you can usually have a different type of chemotherapy (2nd-line or 3rd-line treatment). Some people find that they can lead an almost normal life during chemotherapy, but others find everyday life more difficult. You may feel unwell during and shortly after each treatment, but recover quickly between treatments. You may be able to take your chemotherapy as a tablet at home. Some treatments are harder going than others, and everyone is different. So it is best to do whatever you feel is right for you. As well as feeling unwell physically, it is not unusual for people to have ups and downs emotionally. It can be difficult coping with a diagnosis of cancer and having treatment. So you may find you have good and bad days. Remember that there isn’t a right or a wrong way to be. Side effects of chemotherapy can include: • Fatigue; • Nausea and vomiting; • Hair loss; • Being vulnerable to infection; • Anaemia; • Bruising and bleeding; • Pain and inflammation on the inside of your mouth; • Loss of appetite; • Skin becomes dry and sore; • Short-term memory loss; • Reduced libido; • Loss of fertility, temporary or permanent; • Diarrhoea and constipation; • Depression; • Hand and foot syndrome; • Peripheral neuropathy Biological therapies can help some people with advanced melanoma. They don't cure the melanoma but can control it for a time. The Marie Keating Foundation mobile information units are helping people across Ireland to Spot the Difference. Throughout the summer, the mobile information units, each staffed by a registered nurse, will be visiting schools, community centres, shopping centres, and offices to give people free advice about skin cancer. The Marie Keating Foundation nurses will be handing out free samples of SPF 50 sunscreen, kindly provided by La Roche Posay, alongside information on how to prevent and detect skin cancer at its earliest stages. If you would like to arrange for the Marie Keating Foundation mobile units to visit your community group, school or college, please contact us. This is a completely free service and the Foundation would be delighted to help your organisation learn how to Spot the Difference.